After the deluge of the Friday night before’s rainstorm (seriously, I was beginning to think I didn’t get the invite from Noah about joining him on the Ark. (I mean wasn’t it the point to save two of everything and didn’t he also need two Smart Asses? ), I was very pleased to see the skies had cleared and the sun was shining on the morning of Saturday, August 20th. I put on my pretty new turquoise Kitty shirt and stepped outside. Holy Furballs! It’s cold out here! So I went back inside and put on a hoodie and proceeded to go back outside only to go back inside once more to put a jacket on OVER the hoodie. One can never be too layered on a cold August morning, am right? As I was gassing up at the QT departure location, Linda informed me that Nellie, Suz and Colorado transplant Member and my sister-in-law Alice were going to be a little late. Here’s the story…. Alice has a bright and shiny orange Harley Davidson Fat Boy, but it hasn’t been transplanted from Denver yet, so arrangements had been made for Alice to ride shotgun in Nellie’s Slingshot. Linda, Nellie and Alice were all to meet at Suz’s house at 9:00ish and they would all ride to the QT together. Well 9:00ish came and went and there was no Nellie and no Slingshot. A phone call was made and it went a little like this, “Good morning Nellie! Are you coming?” To which Nellie replies, “Coming where?” “On the Moline ride today.” To which Nellie replies, “What???!!! Holy Crap!!! What???!!! Is that today???!!! Oh my God!!! I’m still in bed, but I can be there in 20 minutes!! Crap, crap, crap!!! I can’t believe I didn’t know it was today!! Don’t leave without me!!! I’m on the way!! !” So that you don’t think Noah should have invited Nellie to the Ark in order to save the Dumb Asses of the world, let me explain. As you’ll recall, the Moline ride was originally planned for Sunday and Nellie was originally not planning to go as she was to be out of town the weekend of the ride, which was later canceled. So when changes were made to the date, Nellie didn’t pay attention since it didn’t pertain to her, hence the confusion about the ride being on Saturday and not Sunday. But as Nellie promised, she flew out of bed and into some Kitty clothes and her Slingshot and the Augusta crew arrived with plenty of time to spare. Before leaving for Moline, we met and welcomed guest Dominique (hereby referred to as Noni) and welcomed Alice on her first official Kitty ride and asked (or rather forced) the new ladies to buy 50/50 tickets, which turned out to be a very good decision for one of them. You’re welcome! We had a brief lesson on wind riding, hand signals and formation riding and biked up with Amy in the lead and Nellie and Alice riding sweep. The route was to be west on 400 and then drop down south on 99, then go east on 160 to Moline. As we pulled out of the QT at Kellogg and 143rd St., Amy pulled into the right hand lane and flipped on her right turn signal. I was right behind Amy and while I’m extremely directionally challenged, I knew that turning right would take us east and not west, so I yelled Amy! Amy! Amy! and finally got her attention when someone, which I believe to be Dawn whose bike horn sounds more like a foghorn on a tug boat, got Amy’s attention. I inched my bike up alongside her and asked, “Why are we turning right? We should be turning left.” Amy looked to the left and then to the right and said, “I think I got turned around.” I motioned to just go straight across Kellogg and we could turn around. Ironically, the very street that we pulled into to do said turnaround was the street where my ex-husband lives, so I’m very familiar with the neighborhood. While everyone else executed a perfect U-turn in the middle of the street, I’m a true believer of going around the block in lieu of a U-turn whenever possible, so I chose that method instead. Now we were headed in the right direction and heading west on 400. We made the turn on 99 without incident, but in Howard Amy flipped on her right hand blinker at the high school and once again executed a perfect tight U-turn. Shelley, who must share my philosophy of “find an easier way to turn around if at all possible”, led the group in a nice wide sweeping turnaround and I pulled up alongside Amy to see what the problem was. Turned out she was listening to GPS directions and had lost her internet signal. I just happened to have just seen a sign that our next road, Highway 160, was six miles away so I assured her we were on the right track so procced as she was. Seven miles later we pulled into the Swinging Bridge Café and starting shedding layers. We got settled at our table and the first order of business is….no, not order drinks…..no, not ask for menus….no, not go to the bathroom. Come on you guys, you know what it is. Order Pie! After juggling who gets coconut cream and who gets lemon and Maureen not having to fight anyone for the Strawberry Rhubarb, we ordered the second course and enjoyed some good ole fashioned home cooking courtesy of the Swinging Bridge Café. Then the long awaited moment came to draw the winning ticket for the 50/50 drawing. I got all ready to win my $35.00 and offered Noni the honors of drawing one of my six numbers. She read the number….and cue the crickets. No exclamations of “I WON! !” including from yours truly. Then it occurred to us that perhaps the caller of the number held the winning ticket and sure enough, we might have pretty much robbed Noni of her $5.00 back at the QT, but she was $35.00 richer for it! We were then all sworn to secrecy that her husband must never hear of this new found windfall. “I mean it you guys! Kitty pinkie swear it!” Which we, of course, obliged. After lunch Dawn and Noni said they needed gas, so I told them we passed a gas station on the way in so why didn’t they ride to the gas station and we would sit tight. The gas station was small and there was no reason for us all to pile in there when we didn’t need to fill up. Okie dokie says Dawn and Noni and off they went. After about 20 minutes, I said, “It sure seems like they’ve been gone a long time considering the gas station is about 2 blocks away.” Amy volunteered to go find out what was going on. After another 15 minutes went by and Amy never returned, we were starting to really wonder what the heck was going on. Someone else volunteered to go look for them and I said, “No way! There appears to be a black hole out there swallowing up Kitties and we can’t afford to lose another one!” I tried to call Dawn. Voice mail. I tried to call Amy. No answer. Then I got a phone call from Amy and all I could make out before we lost the connection was, “They left town.” Wait! What?! They left town? Without seeing the bridge? Without us? A few minutes later we heard the roar of bikes and here comes the three MIA Kitties. Turns out there were two issues that caused the long delay: 1) When I said we passed a gas station on the way in, Dawn thought I meant way back in Howard, which was seven miles away. She didn’t happen to notice the gas station just down the street so they rode the seven miles to Howard and back; and 2) Noni discovered that when she got to about 40 mph, her bike was losing power and going chug-a-chug-a-chug-a-chug. Uh-oh, that don’t sound good. It didn’t take a Buell mechanic to realize there was no way she was going to make it all the way back to Wichita. So, she called her husband and he agreed to load their three kiddos in the pick-em-up truck and head our way. We decided to kill some time and make our way to the Swinging Bridge. Suz and Amy declined to make the walk on the moving bridge (something about puking up all the delicious pie if they did) and given that no one thought to bring a selfie stick and there wasn’t a stranger in sight, they took pictures from the safety of the shore. Meanwhile the rest of us drunk walked our way across the bridge. You know how there’s always that one person who will rock the seat on a Ferris Wheel so it starts a swingin’ until you beg them to stop? Well my Feline Friends, Linda is that person! As if it wasn’t hard enough to navigate while swaying to and fro, Linda was hopping like a bandana-ed kangaroo so that we got the whole, unfiltered experience of a swinging bridge! After a comical sight of Suz and Amy jelly rolling themselves up the embankment to get a close-up selfie group shot, we made our way back to the bikes to decide who would stay with Noni until her husband arrived. “No one needs to stay, you guys go on, I’ll be fine,” Noni says. Almost in unison, 12 other Kitties said, “That’s not how we roll! Our motto is, ‘No Kitty Left Behind’, so shut your pretty and young little mouth!” She then went on to say how bad and embarrassed she felt and we then went on to say how each of us could recall a time we were the ones with a broke bike and someone or several someones stayed behind until help arrived. It happens to all of us and this just happens to be your turn. I said I got nothing better to do this afternoon and then Dawn said I got nothing either. So it was settled, Dawn and I would stay behind with Noni and the rest of the group would return to Wichita via the scenic route of Cambridge to Latham to Leon to Wichita under the leadership of Kathryn. I looked at Dawn and Noni and said follow me; I know the way back to the restaurant where we can sit and have a cold drink while we wait for Mr. Noni Husband. After making a couple of turns and nearly driving out of town, I had to admit defeat, pulled over and used Amy’s line, “I guess I got turned around. I have no idea where we are.” Keep in mind, this town is about the size of Town East Square, but I still managed to get us lost. Have I not admitted I was directionally challenged on many occasions? I consider this Dawn’s fault for allowing me to lead in the first place! Shame on you Dawn! Anywhoo, Dawn plugged the address in her phone and thanks to technology, we found familiar territory. We sat and chatted over ice tea, lemonade and water for a bit when the proprietor of the restaurant asked if we would like to see her rooms. Confused, we all said what rooms? Turns out this one time nursing home, had been turned into a hotel/restaurant about nine years ago and we got a tour of all the sleeping rooms, which were decorated in a lodge theme, with each one being different from the next. Interestingly enough, she has had some celebrities stay there as it’s prime deer hunting territory and there are not a lot of lodging options in the area. Two said celebrities were Justin Bieber and his father (before Justin Bieber became a bit of a brat), and George Strait. Whoda thought?? Soon after our tour, Mr. Noni Husband arrived and we discovered he had an actual name and it’s Victor, and we met their three boys, Juni (which is short for a much longer name that I have no chance of remembering), Julius and Jo. Victor loaded up the bike with a little assistance from us and we hugged our good-byes and Noni made me promise to not forget to send her the membership application, which I pledged to do, and then Dawn and I took off for home. I had opted to go jacketless for the return trip which turned out to be a big mistake. At the 400/99 juncture, Dawn asked how I was with the temperature. She was a little chilly so assumed I must be shivering with cold. Bless you, Dawn, for knowing me so well and now I feel bad for blaming you for allowing me to get us lost….kinda….sorta. We pulled into a gas station to put on hoodies and off we went. Next stop – home. “On August 20, 2016, I made my debut ride with the KKMC. Even though my Fatboy is still in Colorado and is expected to be in Wichita soon, I was able to join the Kitties by hitching a ride with Nellie and her Slingshot. It was such fun! My husband, Gary, is from Wichita and has a deep history here, but it’s a new city to me. I didn’t have the network of friends that I had in Colorado. 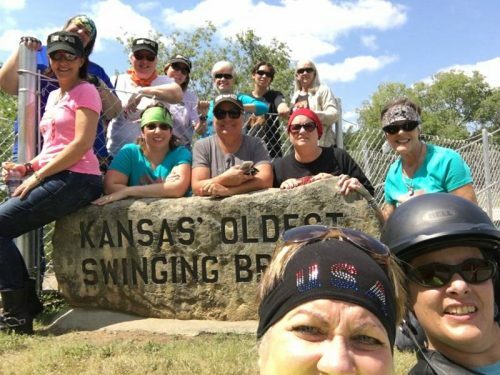 Other than Gary’s family, I didn’t know one single person After meeting and riding with the Kitties, I now feel like I have a whole new network of friends here in Wichita. As a new motorcycle owner, I am still a nervous rider. I am excited to be part of the KKMC, but wasn’t sure exactly what to expect since I am on the newer side of motorcycle riding and haven’t ridden in a bigger group. The only person that I typically ride with is Gary and on a few occasions, we have gone with one or two more riders. One of my concerns riding with the Kitties was that I didn’t want to hold anyone back in the group and was worried if something went wrong. ‘Nuff said! Thank you, Alice, for reminding me of what a remarkable group of ladies we have in the KKMC and thank you Kitties for being so awesome! The Misadventures of Moline is really The Learning Lessons of Moline and as the old saying goes, “Even a bad day on a bike is a good day.” Thank you to all those who contributed to the fun, friendship and fortitude of the day, which were Janice, Suz, Amy, Linda, Nellie, Christine, Maureen, Dawn, Alice, Melaina, Shelley, Kathryn and Guest Noni.